Strong northeasterly winds forced the bluebottle jellyfish ashore (stock photo). 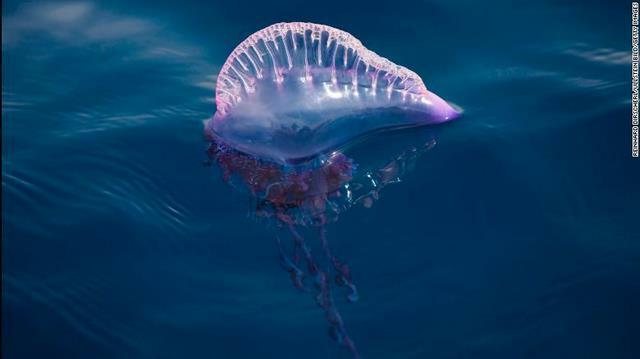 (CNN)Visitors to beaches in Australia's Queensland got a nasty surprise over the weekend: hordes of bluebottle jellyfish, which stung more than 3,000 people on the Gold and Sunshine coasts. According to rescue organization Surf Life Saving Queensland, 3,595 people sought treatment for bluebottle stings over the weekend, while 9,300 have been treated so far in 2019, with nine people hospitalized. In comparison, the organization's yearly report, released in September 2018, revealed that 14,008 bluebottle stings were recorded over the preceding 12 months. Bluebottle stings aren't usually life-threatening, and are typically treated by the application of ice or hot water, the organization said, though CNN affiliate SBS News reported that some beachgoers over the weekend went into anaphylactic shock and required treatment from paramedics. Dr Lisa-ann Gershwin, director of the Australian Marine Stinger Advisory Service, told SBS News that the number of stings over the past month was "unusual." She explained that bluebottles typically live in armadas in the middle of the ocean, but their sail-like crests allow winds to blow them ashore. "When you look at a bluebottle, and you see the bubble and the blue fringes and the long blue tentacles, that is actually a colony, that is not an individual," she told SBS News. "Some of the bluebottle sails are right-handed and some are left-handed, across the body, so when the wind comes up it only grabs the ones with the sail going the right way for that particular breeze," she said. "It's nature's way of making sure the population never becomes extinct."